In Awake, for example, many layers ­– and timescales – of painterly activity are evident on the same surface. Certain marks call faintly from beneath the painting’s white background, others sit in raised crusts on top. 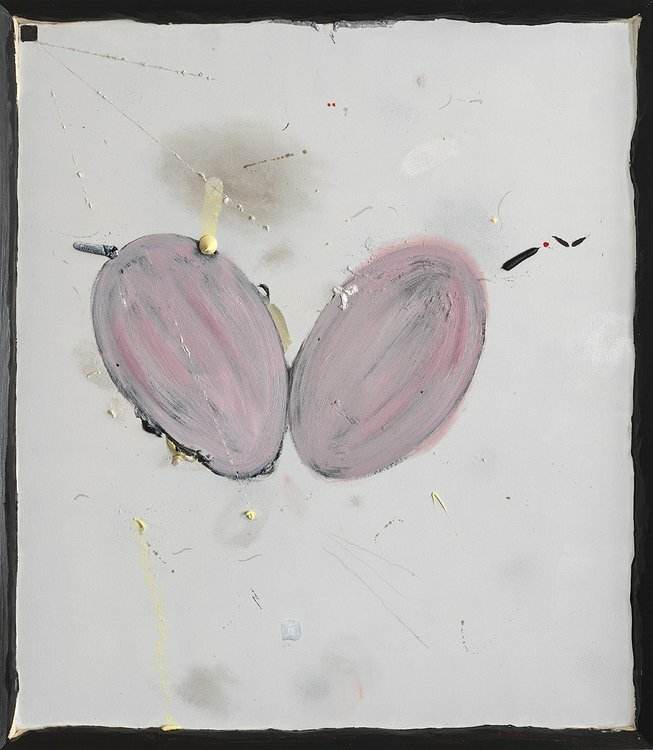 The pink ovoid forms are sullied by heavy black underpainting, and the work’s frame (fixed directly to the wooden board) seems to have been painted last, at certain points spilling onto the picture plane. Hair-like scintillas of paint are flicked across the surface. Blobs of unmixed colour sit like glossy little turds over slow, scumbled clouds of minutely differentiated tones. One extrusion of black paint has been subsequently dry-brushed with white. Once you enter this incrementally subtle micro-world, each event becomes distinctly exciting.